Daniel Contreras founded El Guero Canelo in Tucson’s South Side in 1993. Daniel Contreras went from cleaning dishes at a Tucson Travel Lodge motel to winning a prestigious award, bestowed on regional restaurants that reflect their community, have timeless appeal and serve quality food. 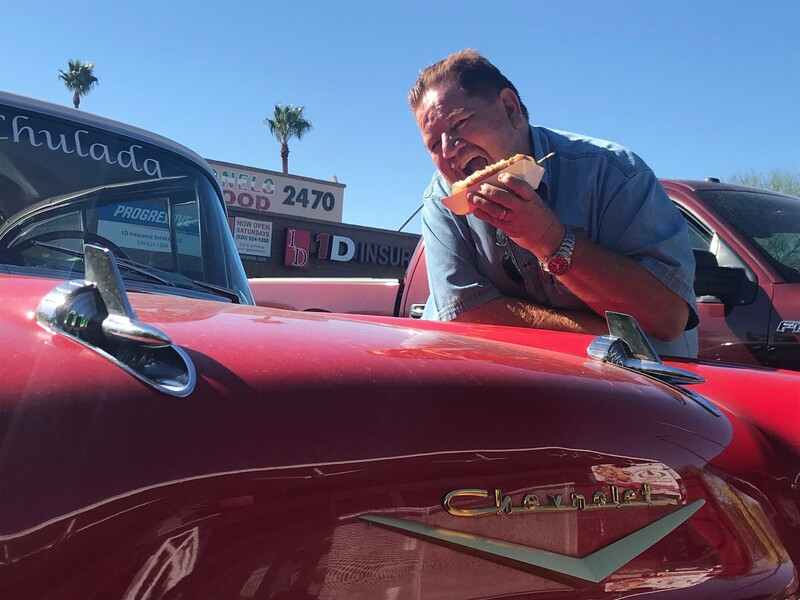 Contreras, who launched the iconic Sonoran Hot Dog and Mexican food institution El Guero Canelo 25 years ago on Tucson's south side, was among five American restaurants chosen for the 2018 America's Classics Awards, given out by the James Beard Foundation. Contreras' immediate reaction to winning one of the most prestigious honors in culinary arts was as much a sense of befuddlement as excitement. "First of all, like I told everybody else, I didn't even know who they were," Contreras said. "I said, 'Well, I don't know who you are.' We miscommunicated because of my English, or I didn't understand exactly what they wanted from us. This is incredible what we have been honored." His shock was matched by Contreras' 24-year-old son Gregorio, who has spent the last few years helping where he can in the family's stores. Gregorio, like his father, was humbled by the honor, and said he's dedicated to making sure the public understands how much the Contreras family appreciates the community's support. "We weren't expecting it," Gregorio said. "I'm almost as shocked as my dad. We didn't really realize how big it was until everyone else started reacting to it. And it's an honor. It's not even our choice; it's the people's choice." A native of Sonora, Mexico, Contreras immigrated to the States in 1979, working a series of odd jobs to get by—before launching his first location (on Tucson's 12th Avenue) in 1993. His signature dish, the Sonoran hot dog, quickly drew praise from publications and persons galore, earning the 56-year-old widespread praise (and customers lined up out the door). "I worked my way from the bottom to the top like anybody else," Contreras said. He soon found his passion was cooking overstuffed hot dogs, with grilled sausage and a host of ooey-gooey add-ons, like onions, sauces and salsas. It soon became a labor of love for Contreras, a self-proclaimed people person. He's known to swing by the red, green and white-painted tables at any of his locations and strike up a conversation with his customers. It's that discourse that keeps Contreras young at heart, with a thick head of red-and-silver speckled hair and a full beard. "People get me going and have always been the best part of my work," Contreras said. "I started as a shoeshine in Sonora and sold newspapers and gum. I like people. It's what it is. People, people." Longtime customers, like Lynn and Bill Hakanson, are drawn to Contreras' assortment of decadent dishes, including meat-laden tacos, burritos and mouth-watering enchiladas. "I like the facility. I used to come by here all the time, and it was always crowded," Bill said. "I didn't know what was going on here. I only came in and thought it was Sonoran hot dogs, so we had to have one." For Lynn, El Guero Canelo's charm comes from its open-air setting (and the tacos, of course). "Well, to be honest, I've always had the tacos, and I can't get past that," Lynn said. "I like the atmosphere. I like the food; it's great. And I like the people here." Gregorio believes the family's success comes from the dedication they put towards their food and the quality of ingredients used in each dish. "The focus on our quality, our focus on very specific menu items," Gregorio said. "Keeping everything simple but to the point and making sure that we make everything with love." Those of you who think such an honor might change the restaurant's simplistic charm, need not worry, Gregorio said. The family knows what's worked with their stores and won't change what's led them to such transformational success. "It's an honor," Gregorio said. "It's shocking. I guess we'll just keep doing what we're doing. We're doing something right, at that point. Right now, we'll just keep swimming and see where it takes us from there."